"This is a cold salad/side dish recipe that has been served in my in-laws home for Thanksgiving and Christmas since the 1950's." In a large bowl mix together the kidney beans, celery, and grapes. Stir in the creamy salad dressing a little at a time. Adjust the amount of creamy salad dressing to suit your taste. 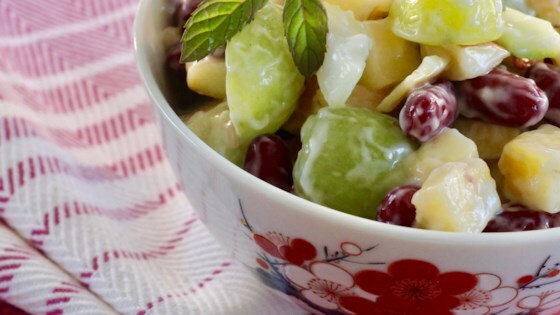 The cranberries provide the seasonal punch to this tasty salad. Love this recipe. If I'm not feeding it to hubs I use lemon yogurt instead of salad dressing. Great both ways!! yummy! i added romaine lettuce and i didnt use dressing. it was good already!